Today I'm over the top excited for my little blog!! 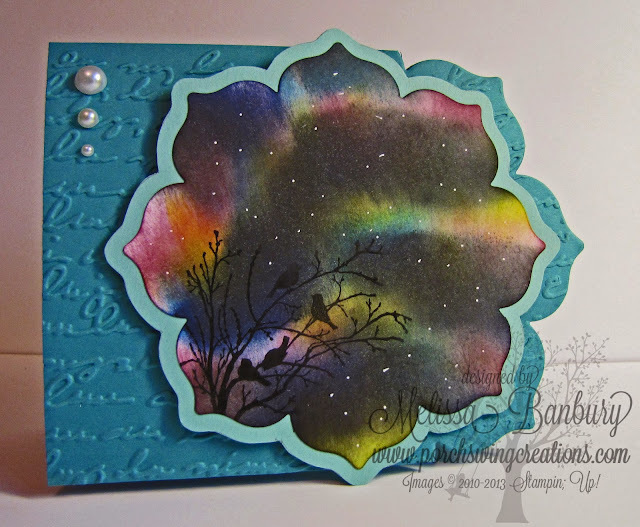 Close to a year ago I submitted some of my Northern Light artwork to Splitcoaststampers; a fabulous resource of tutorials and samples for paper crafters. Shortly thereafter I received notification that my work had been approved and I was scheduled to do a tutorial on my technique for their site! Well, today is the day! I'm honored for my tutorial to be among so many other wonderful and informative projects and techniques. If you've never been to the site, click HERE to see what your missing out on - you'll be there for hours browsing through all the resources and photo galleries of talented artists who have submitted their work! And if you haven't been to my blog before WELCOME! Please feel free to grab a coffee and take a look around. I've done quite a few cards now with this technique; you can see the entire collection by clicking HERE. Congratulations on SCS picking up on your Northern Lights tutorial. Your creations are awesome! I watched your you tube video and while you make it look very easy, I think it would take a lot of practice. Congratulations. I've been a long time follower of your blog and am familiar with your Northern Lights technique. How exciting to have SCS show it off. Love this technique and the card you've created with it!!! Can't wait to try it out. This is absolutely beautiful. Thanks for sharing the technique with the framelits over at Stamoin' Connection.